Venue: Mediterraneo Ristorante, Junction Mall, Nairobi, Kenya. ‘Ladies and Gentlemen, the birthday girl is in the building,’ announced my sister at the table. It was a beautiful evening; a gentle breeze, subtle lighting at the table, candles and dimly lit lamp shades that enhanced people’s smiles and laughter. The group was an intimate one; friends, relatives and plus ones. The girl my sister was referring to was my mother. We had gathered to surprise her for a her sixtieth birthday, a major milestone, and my father, the evening’s wingman, had just sent me a text message saying they were climbing up the restaurant stairs, heading our way. The gathering of people, called at such short notice but having turned up all the same, moved me deeply. I smiled and began to feel giddy…you’d have thought it was my own birthday! My mother was genuinely taken aback when the crowd shouted ‘SURPRISE!’ as she walked in. It’s not easy to surprise her, but she literally put her hand over her mouth and began calling out everyone she was most surprised to see, by name. Her childhood friends, her cousin, her nieces and her sister-in-law. It was a beautiful sight…heartwarming, really. My folks have had an intense year and it was great to see them laugh out loud and relax for the night. As the festivities kicked into high gear, people toasting and conversations flowing, the noise around me drowned out and I found myself trying to imagine myself at sixty. I watched my parents, who I’ve grown very close to. Their wisdom, love and generosity is unsurpassed. In my eyes, they’ve always managed to make ‘the balance’ work. Granted it hasn’t been easy, but they’ve lived long enough to know what works and what doesn’t for them. Will it be the same for me? Will I be surrounded by all this love? Will my children throw me a surprise party and call all the people closest to me to join in the celebrations? Will I have gotten to a point where I’m sure of myself, not living life with any inhibitions? First of all, relax. You’re doing okay. I know you feel like there’s so much on your plate but that’s nothing unusual. You haven’t even seen the half of it! Soon you’ll be a parent and you’ll be learning to balance motherhood, being a wife and still working on all the projects you’re passionate about. You’re nervous, I can tell. There’s a part of you that’s apprehensive about trying to do it all. You’re seeking a new path and in order to be at peace with that, you’ve begun to realize that there’s people that may not understand you or support you while you’re climbing your way up the career ladder. You were young and began to feel in control of it all; you were haughty, sometimes dismissive…but you didn’t mean to hurt anyone. If any of these people are still in your life, just say sorry. Simple. You have to mean it, though, and change the way you approach even the most difficult people. Move along after that and don’t berate yourself for past mistakes. Begin to make bold moves with your passion projects, the time is now and you want to do it while you’re still building yourself. Invest wisely now. At some point, money won’t be everything, as hard to believe as this is. Your family’s well being, your husband, aging parents and young adult children will become priority. Even your own health. You will make mistakes, many of them. You will win and lose, celebrate and mourn. Your forties and fifties will make you so much more comfortable in your skin, so you have lots of time to get there. Before then, you can still reach for the stars and be anyone you want to be. I say this now in hindsight so don’t think it’s a stretch! Trust God, learn Him and learn to grow in Him. I know you struggle with your faith sometimes; many of us still do, but never lose sight of how important this is. And love…yourself, your spouse, your support system, even those that tried to take away your shine; they probably need the most love. Remain hopeful even when the world seems like its burning. Be inspired and stay inspired. Don’t always over think things; sometimes it takes the relentless beating of your heart to go ahead and do something. Some how you always say all the things I want to hear. Such kind words Mayer, thank you! Call it fate,or Gods many surprises,I realy needed this,i honestly dont know what future me says when am in my doubts now but i guess she will sound something close to your letter.Honestly Janet,doesnt take mountains to change a life,this did it for me. Am loving your blog Janet and the pics are great!! To live life unapologetically…. yes we owe that to ourselves. I love the blog.You always inspire me.God bless you Janet. Janet i love this…your stories teach,inspire and entertain…i love the photos too. Amazing post Janet. Your relationship with your mother is to be envied. Just curious, Is Kevin Samuel Mbugua your sibling? Would love to know. Saty safe and have a lovely journey to motherhood. How sweet of you and your family! I’ll be around the same age as you when my mom turns sixty… and I’ll probably have that going in my head. She played both the roles of father and mother to me and I’m eternally grateful. Happy belated birthday to Mrs. Mbugua. She did such a great job raising a jewel like you! God bless you Jan! U r a great woman! Janet, this is so inspiring and good example of how we should celebrate our parents as they grow old. God Bless you. Wow. Ok, I'll just say it. So I've checked the BAKE awards page and noticed that they had no category this year on the Most Inspirational Blog or something to that effect. They may have to include it in subsequent years. Only a few months old and you are already doing such a great job. You inspire me for being so authentic and real. Thanks for that. And happy birthday to your Mom! Wow Janet I must say you have given me a good challenge on that one I must say. Its amazing what you all did for that special woman. Happy New Year to her indeed and my she keep smiling on and on. soon am go do that to my own mother, and I will tell her that I got the idea from you "Janet ule wa TV" as she always refers to you thanks to the INUA DADA FOUNDATION..which she is a huge follower and a supporter of. thank you for the inspirational blogs..
Great piece I watch you always and the strength and self discipline that you possess is something to admire..being a mother I know how it is to watch your little ones grow into beautiful young men and women..May God make the journey of mother hood easy for you. The greatest treasure of a mother is her kids!Thats soo kind to surprise and appreciate your mum….Yes!she deserved that,all those years she has been your mirror and its your time to show gratitude Heko!Dear we all have that very time we speak to our inner self some voices can whisper back to us but we’ve got the authority to shun them down and soldier on……Let nothing steal your destiny go for it Janet ….My role model it’s awesome to read and Re~read your blog blessings! Thanks for that dear, kind and generous words! 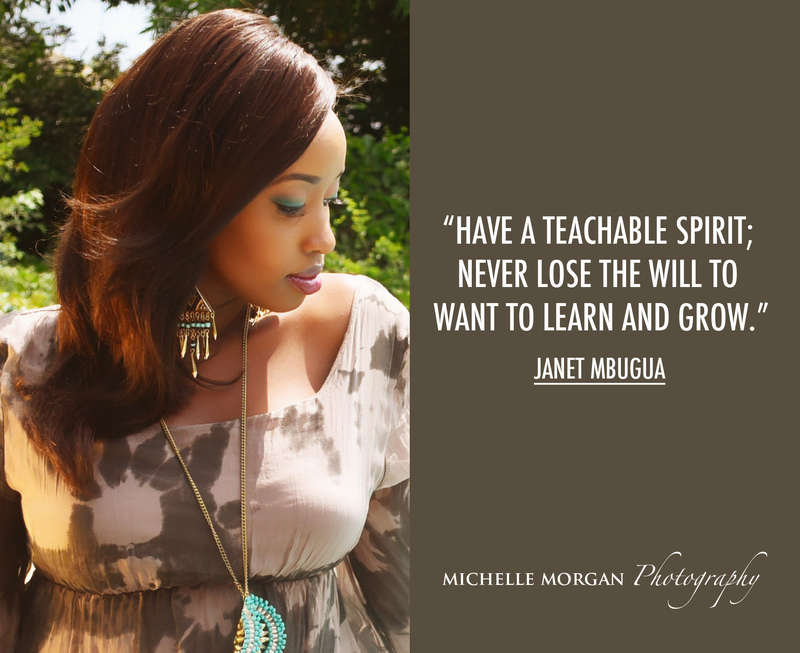 Wow I really like Janet Mbugua Ndichu;-) The last part gives you more strength. Doris!You can say that again……She’s a true definition of who a strong woman is…..I love her soo much! Hi Janet, wow! nice post. you look so much alike with your mum. its always nice seeing ones parents proud and happy of their children. Thanks for sharing your journey with us. i love your posts cant wait for the next one. God bless you! Many thanks for reading my blog posts Kate! I appreciate your comments ? Incredible Janet, always looking forward to reading your next post. You never disappoint. You have always nudged part of my brain from a trance to living my life unapologetically. I love my family, always do. well put….I treasure my parents and I would do anything 4 them…such an inspiring blog….I loooove you! I don’t have a tendency of reading blogs and commenting. I have always read them plus the comments and then close the tab lol. Am so glad that i have read this post (and other posts). I have been working on my patience and procrastination. But this letter definitely summarized off my thinking. I thank God for people like you… You inspire me and I learn a lot from you. God bless you Janet. Thank you so much Ann! I appreciate that you find it relatable. I'm SO not perfect! Lol! Thanks for reading my posts ? God bless you for your kind words, Belinda! You have such a long life ahead of you! God willing our paths will cross someday. Take care ? I love making my mom feel great,appreciating the good work she did of raising me. Am sure your mom will cherish you and your siblings for the party.Your mom did a great job of raising you. So happy to hear that! It's really important to love and celebrate them. Thanks for reading my posts! ? Thanks Linda! Will be checking out your blog soon ? So poignant, well articulated thoughts. I wonder too what the 40's. 50's, 60's and beyond will look like.. that letter is a point of reflection! Janet, good job, i love your work you've got me hooked already! May God bless you and your awesome family. Wow! such wise and moving words. And hey, you have the gift of writing. ?? Thank you for your kind words Carolyne, God bless ? Janet. though I am older than u.. u are my role model. Am 38. your words are from a mature settled woman yet so young. God bless u as u continue to inspire many generations..